"TwoFaced Tuesdays" is a joint venture between CupcakesOMG! and Jenna from The Paleo Project. Each week, we select one secret ingredient and put our own paleo spin on it. You can catch up on the entire series here. Also, if you have any special ingredient requests, you can always tweet us (@CupcakesOhMG and @ThePaleoProject) using the hashtag #TwoFacedTuesday. If you follow me on Instagram (it's "cupcakesomg", obvi), not only would your life be complete, but you also would have seen these from a couple weeks ago. They're pickled deviled eggs from a new restaurant in Adam's Morgan called Mintwood, and they are one of the most surprisingly delicious things I've ever eaten. So, naturally, I had to figure out how to make them. A little clicky clicky on the internet later and I find out these things have been around forever! 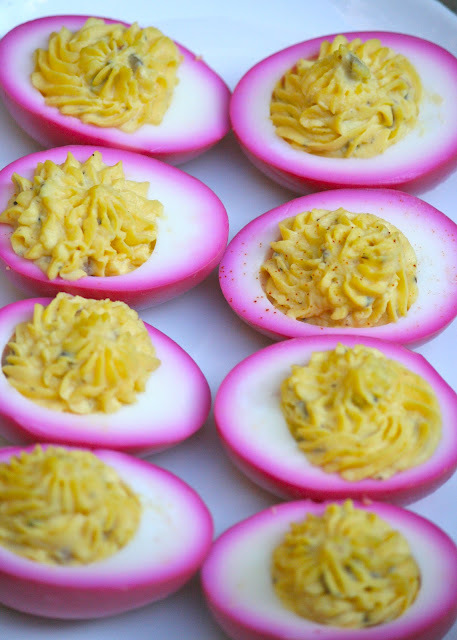 It's knowing that there are still things in this world to discover like pink deviled eggs that just slightly eases the blow of getting older--I'm 28 in 9 days...send me presents!! How do they get pink, you might be wondering? Beets, duh! They "pickle" in a beet and apple cider vinegar brine overnight and absorb the gorgeous pink you see before you. 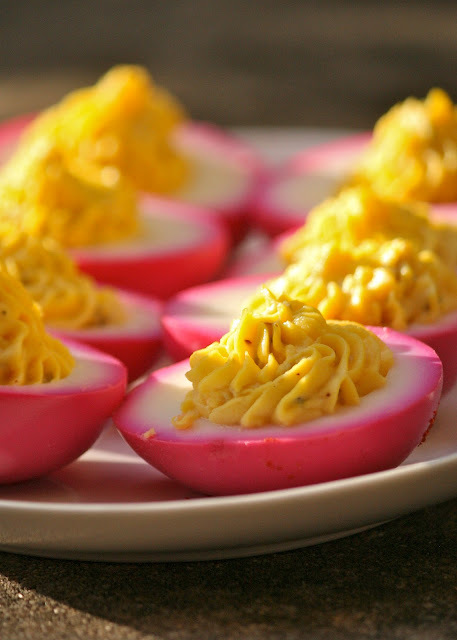 Then, you make the filling just as you would any deviled egg recipe. Fill them with a pretty icing tip and voila! You have a showstopper appetizer that would excite anyone, Paleo or not! 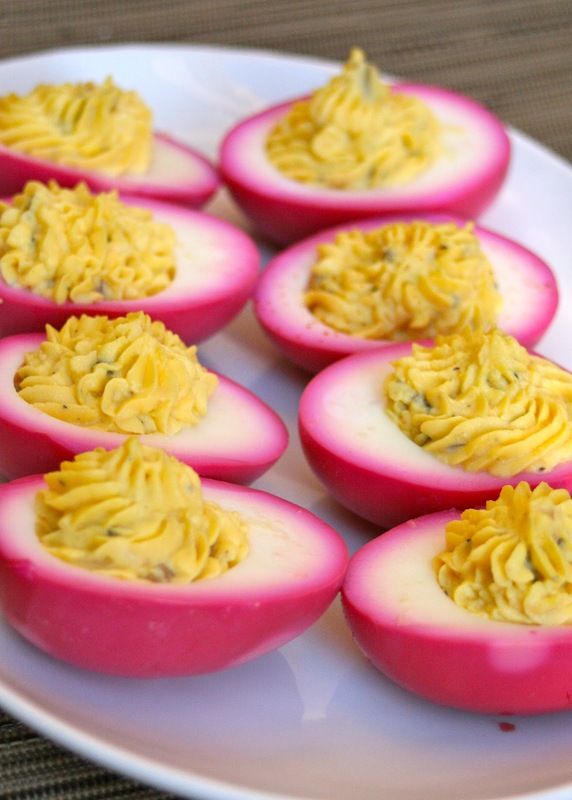 Anyone else had pickled deviled eggs before? Am I totally out of it for just NOW discovering these things?? What's your favorite pink food? 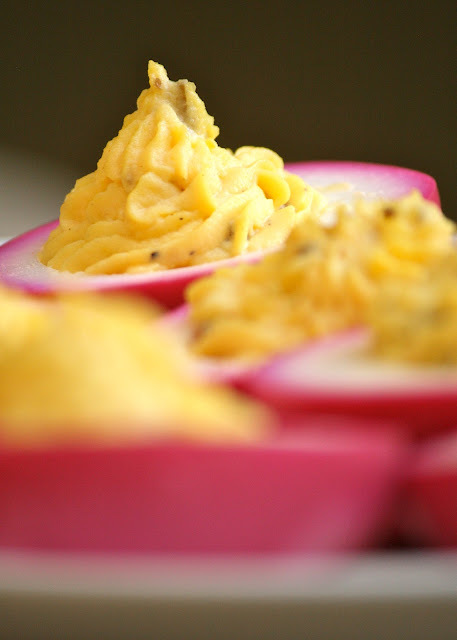 Head over to The Paleo Project to see how Jenna tackles Deviled Eggs!! 1. Hard boil your eggs. Place eggs in a pot, cover with water. Bring to a boil for about 2 minutes. Turn off water and allow eggs to sit for at least 10 minutes in water. 2. To make eggs easier to peel, plunge warm eggs into a bowl of ice water to bring down the temperature. When cooled, peel eggs. 3. To make pickling bring, combine vinegar, maple syrup, salt, and thyme in a large mason jar. (You'll need a really large jar or bowl to make sure you have enough room for the eggs). 4. Add beets and eggs to the brine. Cover the top of the eggs with a layer of beet slices. 5. Shake eggs in brine a few times to thoroughly coat. Place in refrigerator and allow to pickle for at least 24 hours. 6. After 24 hours, remove eggs from brine. Slice in half. 7. Remove yolks and place in a small bowl. 8. Add mayo, mustard, relish, salt, and pepper to yolks. Whip with a fork until mixture is smooth and creamy. 9. Using a Ziploc bag and a frosting tip, pipe filling into egg whites. Wow - I don't even like deviled eggs and I want to eat those! They look fantastic! These are so pretty! You make such delicious looking treats. P.S. 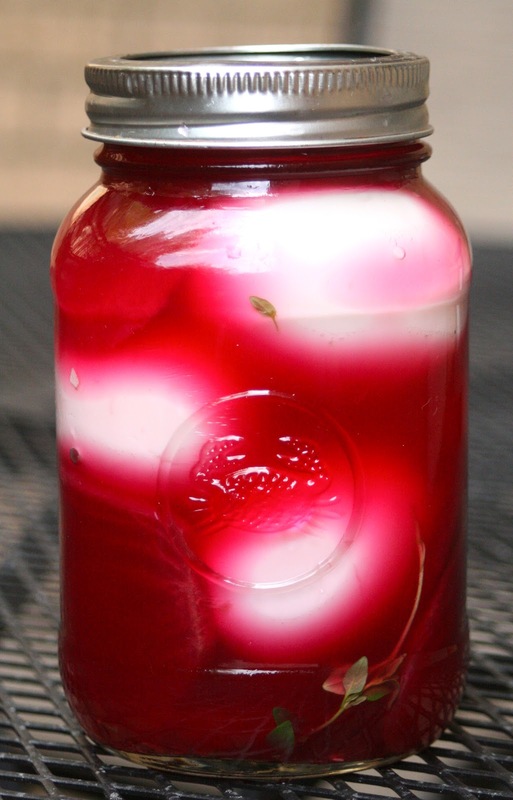 I have a jar of pickled beets in the fridge right now & they are delicious! Maybe when they are all gone (because I've eaten them!) I'll use the juice to make this recipe! P.S.S. Can't wait to see you in nine days when you are 28!!!!!!!!!!!!! These are too cute not to Pin! I'll have to try these soon. MMM GREAT POST:) Your blog is so wonderful and I will happily follow. 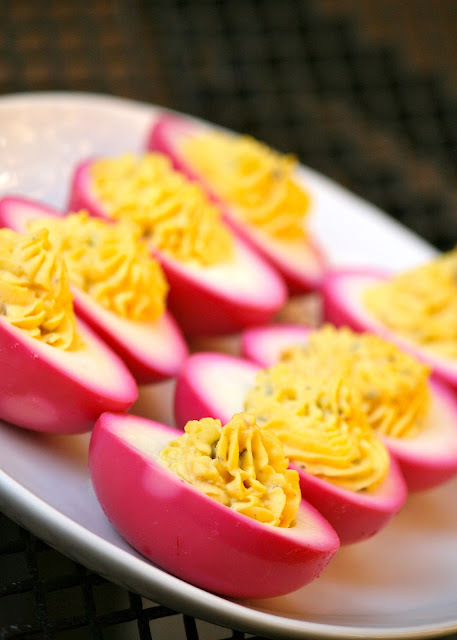 These are the cutest deviled eggs ever made!! I love the ripply filling. Also - these look AMAZING and so fancy! I think they'll be on an upcoming date menu! Those are pink eggs! That is all!